The spark ignited flame, and blazed up. Stop Smoking. Just a spark sometime back. Today? This small spark has been converted to flame and has lit up life of many people. Let the readers of ‘Express Yourself !” read about an inspirational activity started in Bangalore city by a group of enthusiastic people. The Art of Living different courses with different focus. DSN is one of such courses that makes you very strong, dynamic leader with goal to create a divine society. I attended DSN course during Christmas of year 2008. Our DSN teacher Sri R.R. Naickji instructed us to convince the smokers to quit smoking. Normally, many such exercises are given to the course participants during the DSN program, by the teachers for some purpose. But this exercise created a difference… We approached to strangers in group. They were wondering about who we were! Why we were concern for their health, their family! We had many unique and amazing experiences during those few hours. Most of those strangers welcomed our concerns with smile. They gave excuses to smoke. They superficially agreed to quit smoking to get rid of us. Some people even insulted us. It does not matter to us. At the end of day, we achieved many positive results. We made difference in lives of many people. So this was spark. DSN course was over, with excellent learning. However, this process of talking with strangers, made us aware about our social responsibility for the people, who are misguided and wasting their life, their health due to bad habit of smoking. What can we do for them? Some of us gathered and under guidance of Art of Living teacher Sureshji we continued to work. Sureshi started a blog to share experience. Stop Smoking!! Start Living ! We had brain storming discussions about how to approach a stranger smoker and convince him to stop smoking. Many more volunteers joined with us. We prepared banners. We started campaign to bring revolution and make smoking free society. As such our goal is not to close tobacco companies. Our goal is to create healthy society. We approached many smokers on new year day and they took new year resolution to quit smoking. We have lit a lamp and given a name to it - "Stop Smoking Start Living" campaign. So now, spark got air and fuel. It become flame. So far, this campaign was happening only at one part of Bangalore. That area is recognized as HAL, MurugeshPaliya, Old Airport Road. Yes, we got many encouraging e-mails from across the globe, that we posted on our blog. We expand the reach of our campaign. We approached other near by Art of Living center. 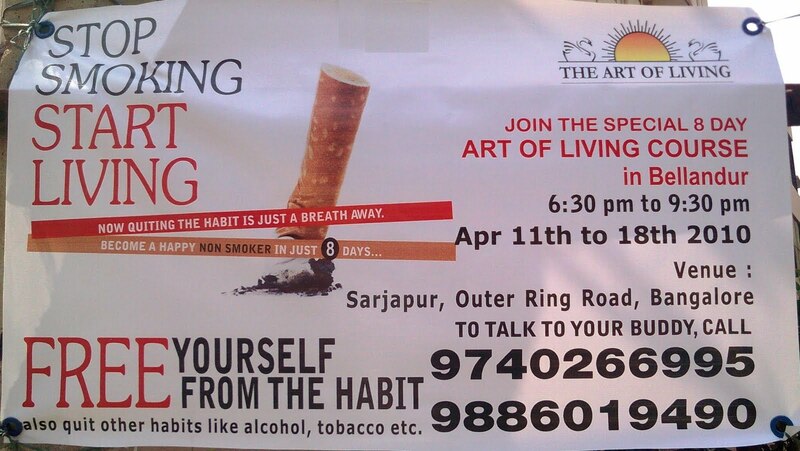 The same campaign replicated by Art of Living volunteers of other centers. Koramangala Art of Living center took it forward. 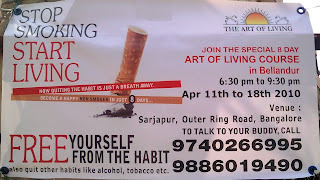 Probably, Sri Naickji’s DSN course students were holding that spark of “Stop Smoking” campaign, at Koramangala also. We all approached Guruji Sri Sri Ravishankar. He blessed this campaign. We identify some useful tools like specific breathing techniques, some processes, some specific medicines etc . All these tools, scientifically strengthen will-power and reduce tendency to smoke. We put all these tools in a package and created a week program. Now, our approach was well-structured, equipped with necessary tools and more result oriented. Art of Living teacher named Ujvalji has conducted many such week-long programs for last more than 1 year. We received many messages, research papers and video testimonials about effectiveness of past programs. So I request your support to bring this transformation. Weather you are IT professional or not, if you are smoking just join this program. It is good for you, your health, your family and our society. If you are not smoking then just spread awareness for this program. Can you do that? I am sure you can. So let this flame grows, blaze up and become a sacred JYOTI which can burn bad habit of smoking. Let’s all light more and more lamps from it, and take the mission forward. We can make a difference to the lives of people and our next generation. I already set context for this event report, by my earlier post. Mobile development has two eras: Before iPhone and after iPhone. The “Mobile Developer Conference” has few very senior speakers, who highlighted the end user usage patterns and gave some advice to young developers with full of wisdom. We had few young speakers, who highlighted their products and also shared some valuable learning experiences, tips about mobile application development. All speakers were very knowledgeable in their respective fields and satisfied all questions from audience. 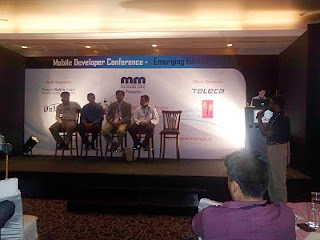 Mobile Monday, Bangalore expected 200 participants. We were more than 225! :-) Now, let's go through details of all the sessions. Declaimer: This note is not verbatim of speech. I have tried to cover the essence, as per my understanding. It may not match sometime with the speaker's original message due to my mistake. So any corrections are welcome. “Developers say app, Consumer say experience” keynote address by Mr. R N Prabhakar from TRAI. Mr. Prabhakar was glad to be with many young people. He shared some numbers and statistics. In last 3 years, Indian telecom market has grown with CAGR of 45%. By June 2010, India will have 581.81 million broadband data connections, out of them only 38.76 million connections will be wireline. Rest all will be mobile broadband connection. This telecom development has significant impact on society and life style of people. People now, immediately call their relatives after reaching to destination while traveling. Businessmen prefer SMS over phone call to avoid informal talk. We can have applications related to video, social network, remote access of network, advertisements, location based services etc. VAS market is at very nascent stage in India. It has no any proven business model. TRAI has issued guidelines for VAS development in India. He explained on deck and off deck model and emphasized for marketing of mobile applications. Market research is very much required to idenify reasons for non-adaptability of mobile applications. It cannot be only price. It can be also ease-of-use and attitude towards mobile application. It is difficult to sell 3G service even at low price. Here are few important points from Mr. Prabhakar's speech. • Mobile applications should be aware about majority mobile Internet has slow speed in India. • Rural market will see more growth in telecom market of India. The Indian market is not only price sensitive, an average rural person will buy a mobile application, only if he sees any direct/indirect benefits out of it. • For example rural youth may like application related to education. Agriculture market, healthcare, regional language and e-governance related applications also can be popular. • ARPU decreases so, now consumer has money to buy mobile applications. • Only 30% of global handsets are smart phone. • We need to educate people for advantage of 3G and our mobile applications. Consumer should PULL applications instead of service provider PUSH them. As per news, Indian mobile operators may use 3G spectrum to provide voice capacity. So one person has concern for mobile applications without 3G data connectivity. Mr. Prabhakar replied if your application is good, innovative and you do enough marketing for it, then you should not worry. My Comments: Yes, his speech reminds me, my experience about VAS and mobile applications. It is not so good. I used to download wallpapers and polyphonic ringtone. However, many times I got charged, even my download fails. Sometime, we get charged for clicking a link, where no charging information is mentioned. I had a mobile application to book movie ticket for PVR cinema. It had bug. At last step, I can enter only 12 digits out of 16 digits of credit card number, in the given edit box!! Only AirTel provides Twitter service in India. I found, AirTel implementation of Twitter keywords is not, as per documentation on the website and there is no technical assistance from AirTel about that !! Free SMS offers often change without prior notice. So I have cultivated a bit skeptic attitude towards the GPRS, VAS and mobile applications. Next keynote session was by Mr. Atul Chitnis. I know him, for his FOSS annual event. “Mobile Applications: The Next Billion Users” He shared his experience as an end-user about mobile devices starting with digital diary of early 90s'. “One can take a device, install third party application and go beyond its original capability.” This started a revolution. Atul identified the potential of such mobile applications, much earlier. As per him, we all are already late. Now we cannot afford to be late to address the need of billions of end-users. They are not sitting here. They have neither used computer, not they want to use. We developers have experience of developing GUI for desktop applications only, so far. The mobile device has small screen and people wish to operate your application with just one hand and without stylus. Even today, few popular air ticket booking websites do not have mobile friendly version. The market for mobile applications is huge, if we target the lower middle class. They just want to stay informed, connected and entertained. We should have applications for traveling and TV programme guide. We should promote, mobile applications as necessary accessories like wrist watch, wallet, pocket combs, spectacles and pen. He showed us a small device without any connection. No USB, no WiFi, no GPRS, no 3G/4G. It has touch screen. It has entire wikipedia. Very useful. We built our network during lunch break. I met few ex-colleagues and friends. We visited stalls by sponsors of this event. “Forum Nokia” was running a quiz contest. Teleca gifted us a key-chain, which has calender for 25 years. I met one gentleman from US. We shared our views about mobile market in US v/s India, Google's entry in ISP market, Qualcomm bidding for 3G/4G spectrum in India etc. He was wondering about few facts mentioned by Mr. Prabhakar for Indian mobile market. Mr. Mohit Saxena and Mr. Sandeep Choudhary talked about market for mobile advertisements and their product to embed advertisements in mobile applications. Their topic was “Nuances of Mobile Advertising Based Apps”. Mr. Nilesh Maheshwari explained advantages for “Automated Mobile App Testing” and few tools like “Monkey UI” and “CTS” for Android applications. One of my ex-colleagues liked the talk by Mr. Mukul Joshi on “Casual Games on Mobile”. He gave some useful tips. One has to test the application/game on all the mobile handsets, as each one has different screen size. We need to choose appropriate coordinate systems in our game. Device Anywhere is useful, but costly tool. It is good idea to distribute your mobile applications/games to youngsters may be college students and let them report back to issue they faced on their mobile. Each device/platform needs different code for same applications. We can only re-use, the design, requirement and the skill/knowledge we gain, across the device. Mr. Edwin Moses – MBA from IIM-A presented some simple but thought provoking facts, in his talk “A Changing Paradigm in Mobile Application Space”. He raised many questions. First he addressed us as future owner of some successful company like Facebook, Google. One can use technology for hobby or business, ultimately it should create money. So far mankind has evolved by monetizing the ideas. He encouraged us to build a successful business model from this changing mobile landscape. All entrepreneurs believe that they have created a right product/service at right time and so they will succeed. It may untrue sometimes. We should always “user promise and over deliver”. What can be reason for broadcast service provider to enter into telecom industry? This telecom industry is highly unpredictable. The top management of big players also not confident about where the industry is leading. If it is predictable, then it will have pattern. So you can write algorithm or formulate business strategy. Here our strategies have short life span. One needs deep understanding of technology, business dynamics and customer to become successful. Yes, during 2000, dot com boom time, many dreams were destroyed, but few companies come out as hero. We are again at the same point. Mobile operators do not want to remain provider of merely dumb pipe. The content is becoming commodity. The definition of smart phone is changing. Earlier, management used to present smart phone as perk. Now it is lifestyle and life style enabler. Device is just silicon chips by vendors like Texas Instruments and Qualcomm. Hardware is no longer competitive advantage. It is now commodity. The service and applications have money. Edwin listed out evolution of players. Mobile operators, device companies, ISPs, Technology companies, Content and marketing services. They all have common dream. “I want to own the consumer”. After presenting this big picture for telecom market, he talked about mobile applications. Yes, application stores are platform. They are growing. Apple, Aircel, AirTel, Verizon, Samsung, Android, Vodafone all have application store. They are real. Today such technology exist, that enable such distribution channel. Developers can get all necessary support from the community. However, there are few not-so-good aspects, that one should be aware of. The developer always thinks about lowest memory consumption and MIPS CPU cycles. Sometimes, he forget the customer. When elephant dance, we should not support any one party. We are not sure, who will survive in long run. Same way, we need to build expertize to work on multiple platforms. This is crowded market place. How a consumer will locate your application among thousands of applications. In spite of all these facts, few key questions have not change. They are: Who is my customer? What is my value proposition? How my offer is different? What is my business model? What is my distribution channel? What is my sustainable competitive advantage? It is not easy to answer all these questions for young budding entrepreneurs. Winston Churchull made a nice statement: “The longer you look back, the further you can see future” Mobile application is not among list of 10 inventions that changed the mankind. They are wheel, fire, Internal Combustion engine, Printing Press etc. So here we need to focus few key points. (1) Recognize the trends, as in the history, people earn huge money from big trend. (2) There is always a cycle. Technology first, second invention and third need. The inventor of mobile handset would never have think that one day, we all will gather here to discuss about mobile applications. At the time of invention, often need is not clear. Like today we have application store, but we are not fully clear about need of end-user for mobile application. (3) Right timing is everything. (4) Complexity is compelling, simplicity is power. Yahoo v/s Goolge serach engine is the best example. He refer one more incidents about dedicated IC chip for MP3 playback in mobile handset. (5) Profit and Loss statement, balance sheet, top line, bottom line they all are still relevant. (6) The appropriate strategy is vital to become successful. (7) This is 'win-win' world. Let's all make money. When a company is growing and want to control whole world, then nature has its own mechanism to destroy it. Look, today the dynasores do not exist. At the end we had panel discussion on “Appconomics – Traps for an App”. The panelists discussed different goto market strategies and its significance of economics of mobile application building. I missed that due to other priority. Overall, I found this one day conference as useful and informative. So I shared the key take away points with all of you – the readers of this blog “Express YourSelf !”. Comments are welcome, as usual. The telecom industry has few typical characteristics. It emphasizes 100% perfection. Perfection for everything. If Alice make phone call to Bob, then Bob's phone only should ring, not his neighbor's phone. :) Alice should get charged exactly for the duration, for which Alice talked with Bob. Demand for such perfection is rate in other industry. Even after datacom, Internet merged to telecom, the need for perfection is as it is. It ensures by thorough testing for telecom equipment, before it got deployed. The emerging telecom standards are becoming complex day by day. Now, to implement such complex standard and that too with perfection, needs a specialized skill set. The firm having such skill set, (OEM) can also demands very high price for its product. This is not consumer market, it is industry market. So high price paid by service provider, is distributed among millions of end consumers like you and me. So far so good. All are happy. All are getting quality product/service at right price. A software engineer working for OEM, got surprise by knowing the deal amount. He wonders, the piece of code which he wrote is so... much valuable that his employer got this much money? A young man, with so many dreams. Finance market has many Venture Capitalists. So now, this young man wants to become entrepreneur. He knows, the complexity part. He can concur it. He can form a team. He can develop a product. A quality product. He can get funds from VCs. However this is not sufficent to become successful in telecom industry. We have many such failure stories. The service provider generally does not trust such new company. The young man, does not have network with CxO of telecom firms. So even telecom industry is quite lucrative, it has intrinsic entry barriers for such new comers. Over the time, open source community took some initiative like OpenClovis, OpenBTS, OpenBSC projects for network side. For handset side, Google came up with Android OS. In year 2007 Apple's iPhone changed the rules of game. Probably Apple is aware that even though iPhone is an excellent phone, the hardware is no longer competitive advantage. The consumer will pay for applications. It opens up the telecom industry for such new players, young entrepreneurs . Still it is not open for network equipment. Now it is open for mobile application development. Mobile application development does not need any big infrastructure, test lab setup that OEM needs. Apple invented a good hardware piece called iPhone, which has full potential to become popular. Apple has two choice. Employee iPhone developers, train them and make sure, they utilize all the features of hardware. It was not feasible. So they opened up the development tools for general public. First time, in the world history, any handset manufacturer provided the whole eco-system to developers community to build mobile application and getting paid for it. They deploy the online distribution channel for mobile applications. And it works ! The individuals were happy, as they got larger share in price of application. Apple was happy, as it got large number of mobile applications that helped Apple to make iPhone popular. It created history. Thus the entry barrier for new comers is broken. So now, many young persons become entrepreneurs. They developed iPhone applications. They sold it. They made good fortune. They got rid of office, boss, performance review and all those corporate formalities. They are their own boss. They got work as per their interest to develop mobile application and getting paid for that. Later on many mobile manufacturers and even service providers followed the trend set by Apple. So over the time, many application stores emerged on Internet. All want to tap the potential of self-motivated individuals to make their brand popular.